David Wiant dedicated 36 years to higher education, with 28 years at Illinois State. He established and developed the University’s personnel program. He advanced to assistant vice president of Administrative Services, yet maintained oversight of the personnel office. Despite retiring in 1986, his success in personnel work resulted in organizations with delicate personnel problems seeking his counsel. He remains active in the McLean County area and supports the University. 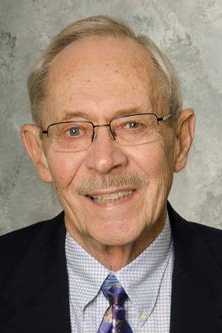 In 2006, his children established the Dave and Jo Wiant Endowed Scholarship within Mennonite College of Nursing in celebration of his 80th birthday. He has helped spearhead fundraising for Athletics scholarships as a past president of the Redbird Education Scholarship Fund. Wiant has served as vice president for The Redbird Club and has held season tickets for Redbird athletic events. For his dedicated service, he was awarded the Stretch Miller Award from Athletics and the E. Burton Mercier Outstanding Service Award.